I am not the type to do all of the extra St. Patrick’s Day activities. You know the ones. The leprechauns creating mischief. The “green pee” in the toilet. The green footprints around the house. My feet dyed green. Every bite of food for the day being green…it isn’t my thing. Last year, I remember feeling guilty that I didn’t do all of those things until I came across a post by some wonderful woman commenting that things had been blown way out of proportion for this holiday. And of course I don’t know where it is–but thank you. It made me step back and evaluate how I want to do St. Patrick’s Day at our house. Sometimes Pinterest has a way of making you feel like the worlds lamest mom because you don’t do all of the amazing things you see. But nobody does every amazing thing you see–lots of people do lots of things and then you look at all of them at once and feel like a failure. I don’t want to do that to you today. In my day, we celebrated St. Patrick’s Day by wearing green so we wouldn’t get pinched by those children just waiting for March 17 so they could freely cause pain to the people around them. As a parent, I wanted to take things up a notch and thought it would be fun to have some green milk with breakfast and maybe some other green food. I like to do learning activities with my kids so we do St. Patrick’s themed activities leading up to it. That’s what we do. Maybe you like leaving it to wearing green. Or maybe you like getting pinched. Or maybe you love to make it a huge holiday to bring some excitement to your life–it has been almost three months since the last major holiday after all! And if you like to go all out and want to, I don’t see anything wrong with it! Here are some various ideas to suit your possible different avenues. See all of my St. Patrick’s Day pins here. I love food. I love to have fun food to celebrate things. If you are a foodie, you will enjoy this roundup of a variety of foods to go along with St. Patrick’s Day. I love to decorate for Holidays. This is something I do even for the “small” holidays. A simple way to decorate is to find a fun printable online, put it in a frame, and change out the printables each season. This post has 17 different learning activity type crafts to do with your children. You want an excuse for some party games? 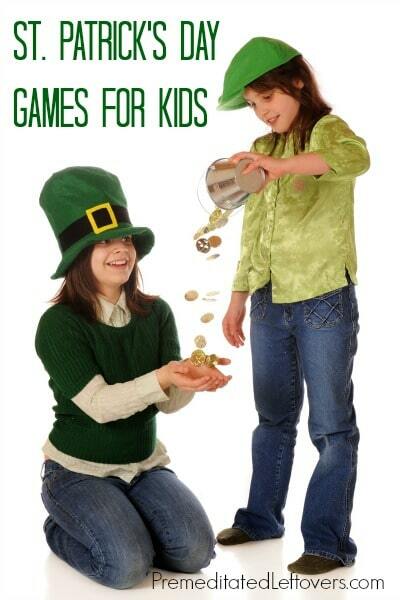 Here are some St. Patrick games for you. If you want to go all out, this is the post for you. If not, only visit if you can be okay with seeing a mom who does go all out.